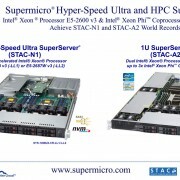 Supermicro Demos 10-Core Xeon® MP Solution at SC10 – Throughwave (Thailand) Co.,Ltd. SC10, New Orleans, Louisiana, November 15, 2010 – Super Micro Computer, Inc. (NASDAQ: SMCI), the global leader in server technology innovation and green computing, is exhibiting an impressive selection of high-performance computing (HPC) solutions at the SuperComputing 2010 (SC10) Conference (booth 3829) held at the Ernest N. Morial Convention Center in New Orleans, November 15-18, including a first peek at the SuperServer 5086B-TRF that supports eight next-generation Intel® Xeon® MP processors in a 5U form factor. Supermicro is also showcasing its capability to deliver all the IT hardware needs of data center, HPC and server farm customers by demonstrating new InfiniBand and 10G Ethernet switches along with its latest SuperServers, SuperWorkstations, Double-Sided Storage™ systems, TwinBlade™ and new 42U SuperRack™. In addition to providing exceptionally clean cable routing for maximum airflow and easy access to rear side system components, the SuperRack™ offers unprecedented configurability with over 100 optional modular components to choose from to enable easy and cost-effective customization to fulfill almost any customer rack requirements. In fact, loading a SuperRack with Supermicro 2U Twin2 (Squared) servers or Double-Sided Storage™ systems provides unbeatable configurations with extremely convenient and easy access to the rear side hot-swappable compute nodes, hard drives and power supplies for unmatched ease of maintenance. While Supermicro continues to introduce new application-optimized 2U Twin2 servers, the company’s new resource-optimized server solutions not only provide the best green technology advantages, such as Platinum Level power supplies that surpass 94% peak efficiency, advanced thermal cooling solutions and more efficient board-level designs to deliver the highest performance-per-watt, but also offer the most advanced features. These features include dual-port onboard 10GbE, 6Gb/s SAS2, up to 18 DIMM slots, and Universal I/O (UIO) interface to support up to three add-on cards in a 1U server to empower our customers to get the most out of their servers without dedicating extra resources. Supermicro’s new InfiniBand and 10GbE switches are designed from the ground up to deliver enterprise-class performance with advanced switching capabilities. The company offers switches in either a 1U form factor for standalone and top-of-rack deployments or in a modular form factor for integration into a SuperBlade® system deployment, including systems using Supermicro TwinBlade™ or GPU blade modules. 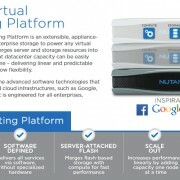 Supermicro, Server Building Block Solution, and SuperBlade are registered trademarks and Double-Sided Storage, SuperRack and TwinBlade are trademarks of Super Micro Computer, Inc. All other trademarks are the property of their respective owners.